Nothing is overlooked in the quest for recycling at REGUA. Some see an old freezer that does not work. Our Young Rangers see a useful piece of furniture. First some artwork then a refurbishment and hey presto, you have a Library! Young Rangers get a surprise! As in many of our Young Ranger programmes, the students are taken to the latest area of reforestation – eleven years on and this year was no different. On one recent visit to the Morro Pai Velho, local resident João and his wife saw the group of Young Rangers on their work without adequate footwear. He decided there and then to order 30 pairs of wellington boots to equip the students. He said that when he was growing up, he hadn’t any to wear and was so impressed by REGUA’s commitment to the younger generation that he wanted to find a way to reward them with this generous present. Many thanks for your generosity João! 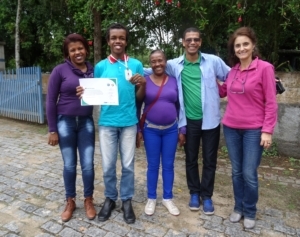 REGUA’s Young ranger Miguel Conceição has successfully completed his guide training course with honours. The course was administrated by the State organisation, INEA and Três Picos State Park with the aim to qualify and prepare youths as professional guides in the region’s parks. The course focuses on youngsters who like nature and Miguel was selected after showing a real aptitude for nature in our Young Ranger programme. Everyone at REGUA is very proud of his achievement – it just shows that with determination and perseverance one can achieve great things. Our education officer Professor Carlos is thrilled with his star pupil however, he is adamant, that all of the youngsters participating in this course have the capability to achieve this type of success. As Miguel says, “It is my dream to become a biologist”. His mother is rightly very proud and overjoyed as the course has inspired and instilled many values with the local youngsters, and says REGUA has been the best thing to happen to her family. Wow!!! We owe it to people like Miguel who believe in what we are doing and are prepared to take up the opportunities that are offered their life. Thank you also to INEA for offering the chance to change this young man’s life. 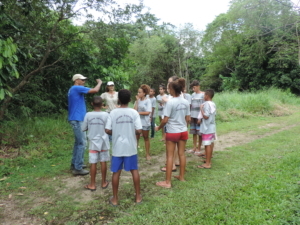 Rio’s State Environmental Institute (INEA) organized a summer training course called “Trail Guiding” whose target audience were participants from the local areas of Cachoeiras de Macacu and Guapimirim. Thirty people enrolled in this course including REGUA’s young ranger Miguel – just shows how inspiring REGUA can be! 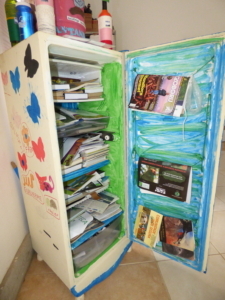 The aim is to prepare local guides to help visitors at the Três Picos Park and Natural Park at Macacu. 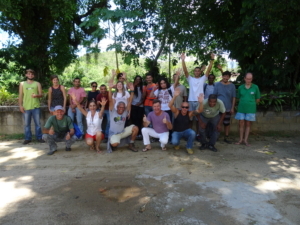 The guides love nature and need to gain experience, knowledge and confidence to show visitors all the beauty and diversity of the Atlantic Forest. Part of the course covers Bird guiding, and as Regua’s guides have become well known for their skill and knowledge, we were happy to host the birdwatching event around our restored wetlands. Adilei de Carvalho and Cirilo Vieira, Regua’s bird guides, were in charge of the training, giving a talk on what birding is about and showed them some of the most representative lowland species in the wetlands. 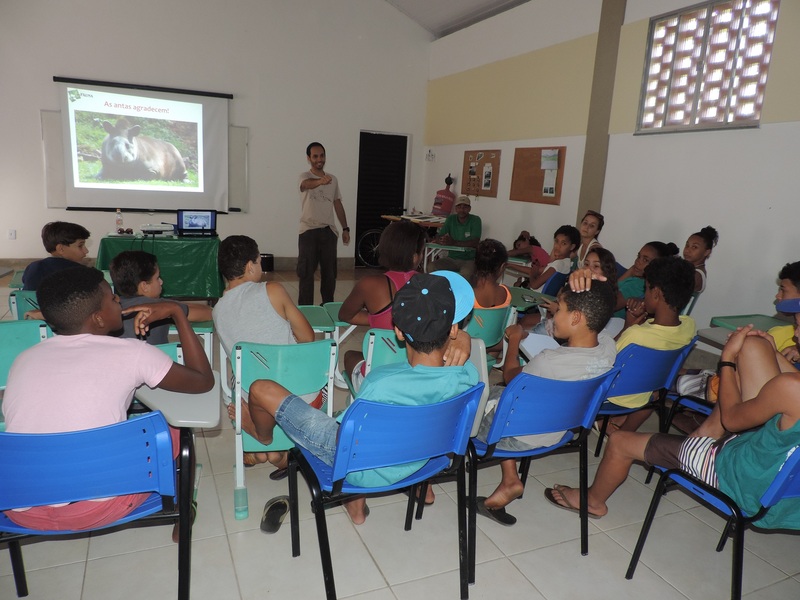 As we progress the Brazilian Tapir (Tapirus terrestris) re-introduction programme, it is vital that the local communities are aware of the project and understand the value of Tapirs to the diversity of the forest. 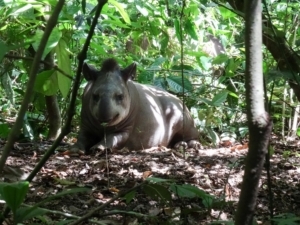 Nicholas and Raquel are working with the Team on this vital issue – considering the possibility of the Tapirs advancing into local fields and feasting on manioc, corn and guava! Brazilian Tapirs have been extinct for the last 100 years in the state of Rio de Janeiro. They can reach 300 kilos and their diet is based on fruits, leaves and shoots, making them very important seed dispersers and soil fertilizers. It is not only the adults that are involved in this education programme however. Professor Maron Galliez and Joana Macedo recently organized a session with the Young Rangers. After the Team explained what Tapir are and the reason for their re-introduction, there was a lively audience participation session which the Young Rangers thoroughly enjoyed.